When I met with Dianna Ward in a conference room at the Neighboring Concepts office in west Charlotte's Mosaic Village on a recent afternoon, she jokingly told me I should sit at the other end of the table. 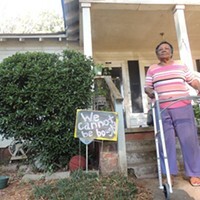 Ward had been sweating it out on the streets all day, spending hours on a hot afternoon going door-to-door in a number of neighborhoods in the 5 Points area, hanging flyers on door knobs and letting people know about an upcoming event she hopes will help connect newcomers with a rapidly changing area of the city. Pedal to Porch is a bike ride through the neighborhoods along the Beatties Ford corridor near Johnson C. Smith University. 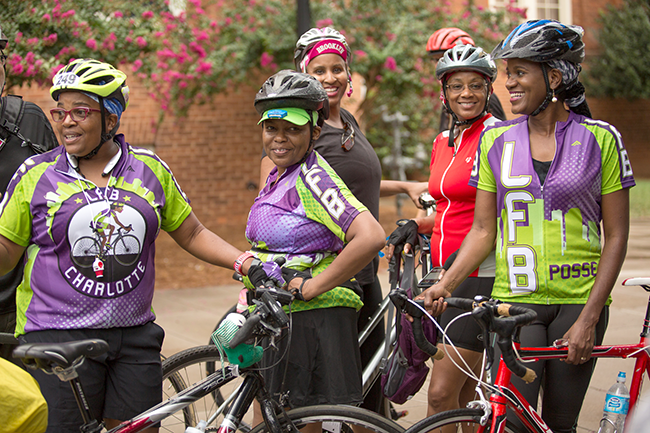 Riders will take off from the LATIBAH Collard Green Museum at Mosaic Village on Saturday, October 6. While Ward has helped organize many rides like it in the area, this one will be the first of its kind, as it includes storytelling at stops along the route, educating folks about the history of west Charlotte. The ride is then followed by a community meal in the open space around LATIBAH. The idea originated in Detroit with Cornetta Lane, a community organizer who became interested in the power of storytelling as a healing process after her father was murdered in 2015. The following year, she hosted the first Pedal to Porch event in Detroit, creating a route for a bike ride with stops along the way where local residents told stories from the porch of their homes or other meaningful locations. Earlier this year, Charles Thomas, program director at the Knight Foundation, approached Ward about holding a similar event in west Charlotte. 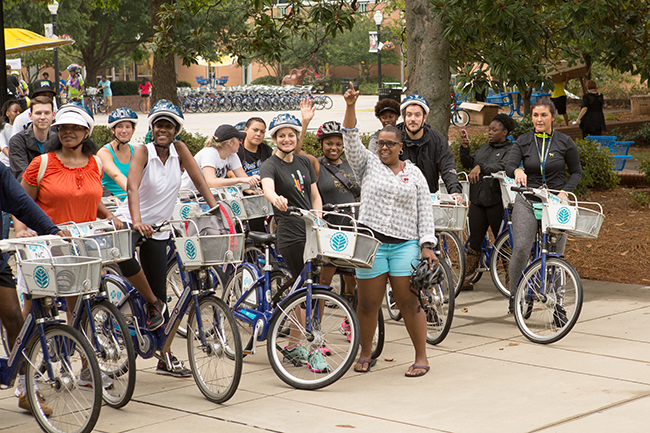 Ward, executive director of the Charlotte B-Cycle bike-sharing program, had held similar bike rides through the corridor in the past, including the back-to-school ride, an annual event in which JCSU students and others took B-Cycle bikes around the neighborhoods surrounding the school. While Ward has seen plenty of success with those events — more than 100 people usually show up for the back-to-school ride — she had been contemplating ways to get surrounding community members more involved. Pedal to Porch seemed to be the perfect way to do that. Ward approached neighborhood associations up and down the corridor, including Wesley Heights, Seversville, Biddleville, Smallwood, Historic Washington Heights, McCrory Heights and Oaklawn Park. The ride will also stop along Beatties Ford Road and at Mosaic Village. Renee Pride-Dunlap, president of the Oaklawn Park neighborhood association, was one of two people in charge of finding speakers for the route. In the end, she was able to sign up nearly 20 people, business owners and residents from throughout the aforementioned neighbors. Speakers include Dorothy Counts-Scoggins, who famously integrated Harding High School in 1957; and Wallace Pruitt, known as the "Mayor of Seversville" and for whom the Wallace Pruitt Rec Center is named. Two guests Pride-Dunlap wanted to be sure to include come from Oaklawn Park: Anna Hood, a community organizer and political activist whom Pride-Dunlap calls "the strength and backbone of Oaklawn Park;" and Bob Johnson, publisher of The Charlotte Post. Pride-Dunlap grew up in Oaklawn Park and eventually moved back as an adult. She's watched as the city's growth has resulted in urban sprawl, gentrifying some of the historically black neighborhoods near Uptown. "There's people here that don't know their history," she said. "The new people that's coming, it's rich history here on the west side that a lot of people are not aware of, and I really wanted to get involved with that. I'm big on saving the character of some of these neighborhoods, so that's how I got involved, because if you know Charlotte, they are wiping out all the history, so I really wanted to let people know and be an advocate for saving the character of some of these places." 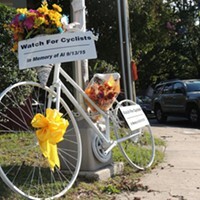 Ward has also seen the faces of these neighborhoods begin to change, and she hopes Saturday's bike ride can begin to build connections between some of the neighborhood's most important leaders and new residents. "We have these neighborhoods where there are people who have been here forever and new people coming in and they don't trust each other, they don't know each other's stories," she said. "So why don't we make it such that we get to know each other by bringing them bikes, food and storytelling?" Despite the larger issues that gentrification brings — issues like displacement — Ward said she's optimistic that the folks who are moving into the area want to help their new communities preserve their history while progressing into the future. In her eyes, it's just a matter of bridging the communication gap. "Sometimes when we see people that don't look like we do, or have backgrounds that are unlike our own backgrounds, sometimes it's intimidating to have conversation, and what I like about this is it's going to give people more background about a neighbor that they might have wanted to know," Ward said. "Sometimes we make up stories in our head about our neighbors — both the ones that are moving in and the ones [that have been there]. What we're finding out is the people all just love this neighborhood, whether they've been here or whether they are moving in here. "I think that they all share the vision, they all want to see progress, they can come together on that point," she continued. "Now, what progress looks like, I think that there's probably work to be done on that." But if Ward can get people starting those conversations while also encouraging them to learn more about the city's cycling infrastructure, that's a step worth taking. As for Pride-Dunlap, she'll be bringing her bike to the event Saturday, enjoying the storytelling that she helped curate while taking part in her first group ride, because it's not just the new residents who have something to learn. "There are some stops on there that even I really don't know the history of," she said. "So I'm going to ride as well."